Global Advanced Training & Educational Trust is an autonomous institution registered Under Trust Act. From Govt. of India N.C.T. New Delhi. Institute of Solar Technology is a unit of Global Advanced Training & Educational Trust. Global Advanced Training & Educational Trust is registered Under NITI Aayog (National Institution for Transforming India) (NGO-DARPAN) Govt. of India, Reg. No. WB/2014/0084581. Key Issues: MSME, New & Renewable Energy etc. The institute has been awarded ISO 9001:2008 Certification after evaluating and audited its on International Accreditation Forum, (IAF) standards of the global best practices in Organizational Management, Academic Management and Institutional Performance. International Accreditation Forum's accreditation is a proof that Global Advanced Training & Educational Trust offers education to its students that is on par with global education standards and that the institute is fully committed towards continuous improvement of its educational standards and job placement across the world. This Internationally recognized certification gives global acceptance to the students of the Institute. Institute of Solar Technology is Listed Renewable Energy Training Institution in India under NATIONAL INSTITUTE OF WIND ENERGY, Ministry of New and Renewable Energy, Government of India. National Institute of Wind Energy (NIWE). NIWE, is an autonomous R&D institution under the Ministry of New and Renewable Energy (MNRE), Government of India established to serve as a technical focal point for wind power development in India. Institute of Solar Technology is an Authorised Training Center of National Institute of Entrepreneurship and Small Business Development, (An Autonomous Institute under Ministry of Skill Development and Entrepreneurship), Govt. of India. In order to promote entrepreneurship / self-employment among the youths as per policy of Govt Of India , so that more and more students may take up self-employment to contribute to the GDP of the country , Being an empanelled Training Partner, we offer NIESBUD ( Govt of India ) certified course on skill development & entrepreneurship Development where alongwith study we also help the person with hand holding for starting the business. 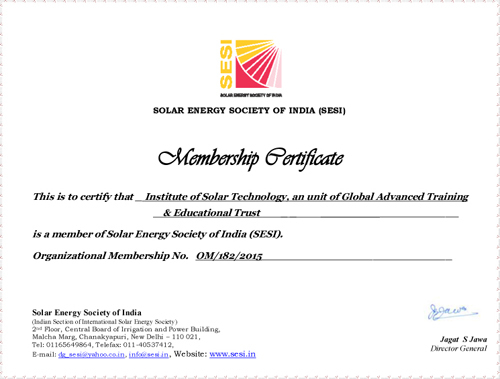 Institute of Solar Technology is Organizational Member of Solar Energy Society of India, (the Indian Section of the International Solar Energy Society (ISES)). Its interests cover all aspects of renewable energy, including characteristics, effects and methods of use, and it provides a common ground to all those concerned with the nature and utilization of this renewable non-polluting resource.